The Model 7610 is a 17 watt Wideband Power Amplifier Module that offers extended output power and voltage capabilities, low distortion, versatility and the latest in hybrid CMOS power operational amplifier technology, with performance features not available in other power amplifiers in a compact size. 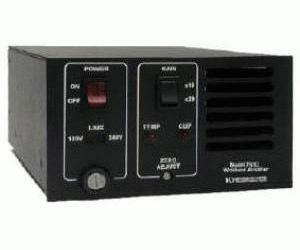 The 7610 provides 17 watts of continuous power (34 watts peak) and 141V rms from 10Hz to 500kHz. The frequency response is ±0.1dB to 10kHz, and the distortion contributed by the amplifier is <0.01% to 5kHz and <0.3% to 100kHz. The voltage gain is non-inverting and has selectable ranges of X10 and X20. Input coupling is AC with a cutoff at 7Hz. Other features include an output dc offset adjustment on the front panel and circuitry to prevent large voltage transients on the output at power on and off. An over temperature output shutdown circuit with auto recovery and output clipping indicator is also included.